The Tangomania in LA during the summer of 1986 was not to last; by September it was all over. "Tango Argentino" left Los Angeles to play in other cities and countries around the world. Without this show at the Pantages Theater, and the accompanying television publicity, interest in tango soon waned. We were all wondering if the initial enthusiasm for tango could be maintained, or whether it would all soon die out. I'm afraid it almost died out. By the end of the year, there were only about 6 or 7 of us left; but we all shared the goal of trying to keep tango alive in Los Angeles. Hello; if it seems that I know a lot about the early years of tango in Los Angeles, it is because I lived it 24/7, week after week, month after month, and year after year. Tango for me was every night, non-stop. 1) The producers of the show, and their agents, did something unusual: they invested heavily in television advertising, going far beyond what you would have experienced with most shows or movies. In those years, there was no cable or satelite TV, and no internet or PC's. If you had a show or movie to promote, you had to do it the old-fashioned way, with ads placed in local newspapers, in magazines, on the radio, and especially on local television stations. In the mid 1980s, we greatly benefitted in LA by the arrival of a great tango teaching couple, Danel & Maria Bastone. This was at a time when a great many people wanted to learn tango, and there were almost no teachers of this extremely complex dance. There were many tango performers and show dancers, but almost no one had ever taught a class in the subject. No one, that is, except Danel & Maria. They were (and remain to this day) an exceptional couple. Danel had been a child dancer during the Golden Age of Tango in Buenos Aires and then immigrated to New York in the 1950's. 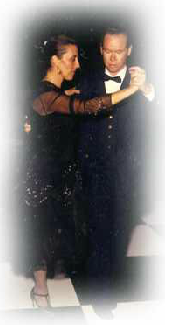 He then trained in all aspects of ballroom & latin dancing, and later owned several dance studios with his wife Maria. In the late 1950's Juan Carlos Copes & Maria Nieves moved to New York, and studied ballet at a studio that Danel owned. (He later performed on the Ed Sullivan TV Show, four years in a row.) Danel and Copes at that time started working on how to teach this dance: What should basic step be? What is good technique? What material should be taught, and what should be avoided? How should a class be organized, and how should North Americans be taught? And whose version of tango should be taught (since every neighborhood of Buenos Aires danced it differently)? Believe it or not, as old a dance as tango is (nearly 150 years), these questions had never been worked out. Remember that in Buenos Aires, according to Eduardo Arquimbao, there had existed almost nothing in the way of organized tango classes at dance studios, the way that North Americans are used to. In those years, people learned tango from family, friends, and neighbors; and by attending events at social clubs that most families belongs to in the Buenos Aires of the Golden Age (approx. 1935 to 1955). Danel & Maria were the very first to teach North Americans this dance, in New York in the late 1950's. The great value in having Danel & Maria with us in Los Angeles, is that we finally had a very professional teaching couple, highly experienced, that was able to steer us in the right direction. Danel & Maria were among the very few who were able to conduct a class, count things out, and get people dancing. They were excellent at teaching men (quite a feat with this dance), and the men they trained are among the best leaders and most sought-after partners in New York. They just had so much more experience compared to anyone else. To this day, Danel & Maria deserve a lot of credit for guiding us and steering us in the right direction during those early years in Los Angeles. I was able to arrange for them to return to LA several times a year between 1988 and 1996 on teaching tours. They also taught extensively in San Francisco. They remain to this day the most experienced of all instructors, and the ones with whom many of us still consult. You should know that tango already existed in Los Angeles within the Argentine community, well before the advent of the show "Tango Argentino." But it was limited to events held within the Argentine community (immigrants from Argentina who lived in Southern California). There was a "Club Argentino" and also the Asociación Argentina (Argentine Association). There was an Argentine Club in Orange County also. The Asociación in those years was located at the present Burbank Hall of Realtors, where many years later Mark Celaya & Joan Yarfitz would hold their milongas; the Asociación would later move to their present location on Glen Oaks Boulevard. In those years, these organizations, together with some small Argentine restaurants, would host various tango musicians, dancers, vocalists, folklore musicians & dancers. Both the Club and the Asociación would have milongas. But all this was pretty much unknown to the general North American community. With the advent of the Broadway Show "Tango Argentino" playing at the Pantages Theater in Hollywood, Miranda Garrison sponsored the first really nice milonga open to the general North American public. This was at the Hollywood Roosevelt Hotel, in their nightclub called the Cine Grill in those years. That was in May of 1986, and Miranda hired one of the few tango bands that existed in North America. The leader (and bandoneónist) was a man named Osvaldo Barrios, and his band was called "Tres para el Tango” (“Three for Tango”). This was the first time that most Californians got to see what a bandoneón was, and what authentic tango music really sounded like. At that time in history, it was very hard to put together a true milonga. There was no internet. People did not have PC's. No recorded music was available of tango from Argentina. We had no tango deejays. Ipods did not exist, let alone cell phones or affordable camcorders. Music CD's and CD players were a new & expensive technology. If you wanted to sponsor a milonga, you had to do it the old fashioned way: find a live tango band. Many people spent the next few years telephoning all over North America (before we had the internet) trying to find out if there were any Argentine bandoneónists willing to come out of retirement and play for dancers. As I recall, there was a band in New York that played at a little place in Manhattan called "La Milonga" that Robert Duvall talked about, and we heard of one in Miami. That was all in 1986; there was nothing available in between. No tango yet existed in today's major tango markets. The few people in San Francisco used to drive down to LA and dance with us down here. Paul Palmintere, who currently lives and teaches in Las Vegas, is a long-time tango veteran, and was a founder of the big Los Angeles Tango Community in 1986. Over the years, he has trained extensively with a great many of the famous instructors of Buenos Aires. A highly experienced and respected teacher, Paul is well-remembered for his pioneering classes throughout Southern California: Hollywood, Burbank, Los Angeles, Orange County, Riverside, San Bernardino, Redlands, and Palm Springs. How did Tango in Los Angeles start ? Who were the dancers and community developers who laid the groundwork for the rich and diverse Tango community we participate in and enjoy today ? LA Tango dancers Mitra and Holly started wondering about our community's Tango history. Holly started reaching out and interviewing many experts on Tango in LA, including Joan Yarfitz, Loreen Arbus, Linda Valentino, Julie Friedgen, Homer Ladas, and many others, all of whom generously shared their time and their stories. We're so grateful to all of them for all they have done to build Tango in LA. In the process, Holly got in touch with Paul Palmintere, who personally witnessed much of LA's earliest Tango history unfold. In this series of open letters, Paul shares with her some personal stories from the earliest days of Tango in LA. We share them with the community here with the hope that learning about where we came from as a community can give us fresh ideas on how we might grow in decades to come. Read the first letter here!